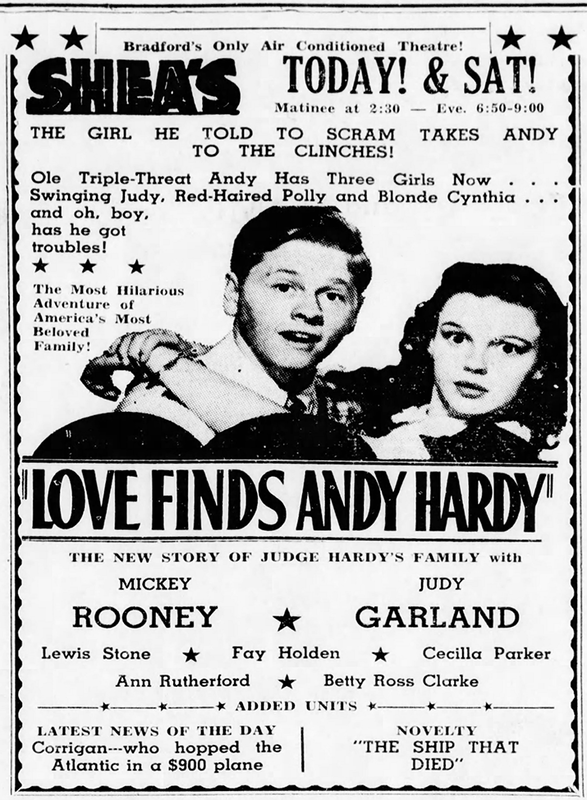 July 21, 1933: The third night of a week-long engagement for Judy, still going by her birth name Frances, at the Warner Brother Downtown Theater in Los Angeles, California. The ads from now through the end of the engagement do no list “Frances Gum” as they did for the first two night. The Meglin Kiddies were a part of the same bill and since Judy was a part of the Meglin Kiddies it’s likely she performed with the group for the entire week, still singing a solo, even though she isn’t listed separately. July 22, 1939: Behind the scenes photos began to appear in papers and magazines around the world promoting the upcoming release of The Wizard of Oz. This example is from “The Advertiser” out of Adelaide, Australia. Here are some behind-scenes shots of the M.G.M. technicolor film of “The Wizard of Oz,” now in production. 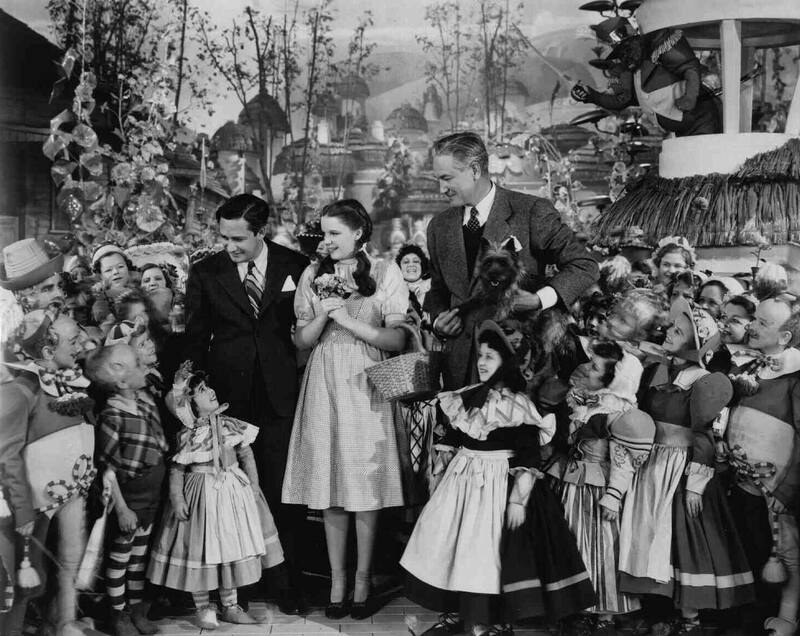 First picture shows Mervyn Leroy (producer), Victor Fleming (director) and Judy Garland, who appears as Dorothy, whose adventures finally lead her to the enchanted Emerald City. 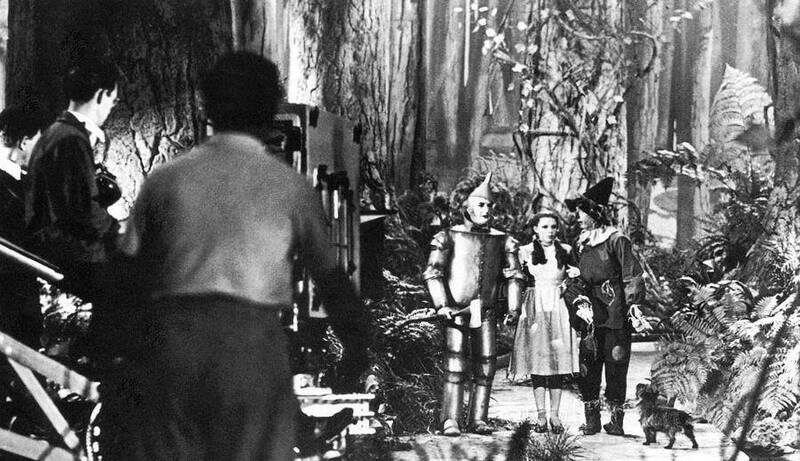 In the second picture are seen the Tin Man (Jack Haley), Dorothy, and the Scarecrow (Ray Bolger). Others in the cast are Frank Morgan as the Wizard, Bert Lahr as the Cowardly Lion, Billie Burke as the Good Witch and Margaret Hamilton as the Wicked Witch. Also on July 22, 1939: This letter which was allegedly written by Judy appeared. The column is dated the 20th of July. When a person works for six months on a picture, she ought to have something of interest to write about even if that person is only a sixteen-year-old girl whose best subject in school isn’t composition. You see, I’m talking about myself and “The Wizard of Oz” and I owe you a letter so here goes. As you know, “The Wizard of Oz” is made in Technicolor and was it hot on those sets? Whew! I kept feeling sorry for Jack Haley dressed in tin from head to foot; Ray Bolger all stuffed with straw and Bert Lahr with a huge lion’s skin wrapped around him. I expected any minute that Haley would begin to fizz like a steam kettle, Bolger go up in spontaneous combustion and Lahr float away like a hot-air balloon. A lot of things happened on the set. Mr. Bolger was always scratching because the straw stuck him. Mr. Haley often fell down in that heavy tin suit of his, and when he did, he couldn’t get up alone. Someone had to help him. He was always saying he was going to get a can opener and cut his way free next time. They had lots of animals on set. The cutest were some baby pigs. I thought I liked them fine, but I hat to fall into the pen for a scene and the first time the mamma pig charged me. Wow, was I scared! Mr. Shenberg, the assistant director, got me out then Toto, my little dog in the picture, got mad because the mamma pig went after me and he went after her. Then they had to go in a rescue Toto. There were two white horses that had worked together a lot. For “The Wizard” they dyed one purple and the other yellow. It was harmless dye, but you should have been there when they brought those two horses together. They shied like they’d seen ghosts. They weren’t dumb. They knew there was no such thing as a purple or yellow horse. Ray Bolger, being stuff with straw, was a fire hazard, everyone said, so they had a fire extinguisher around him all the time, but he only caught fire once and that was in a scene. The wicked witch – that’s Margaret Hamilton – had to set fire to him. Mr. Bolger didn’t bat an eye, but it made Miss Hamilton, so nervous she got faint. Once Miss Hamilton lost her green nose. She wore it as the witch and it was metal. She put it in her purse when she finished work one Saturday and went to a movie and someone snatched her purse. I sure wish I had seen the snatcher’s face when he opened that purse. The make-up men had to make her a new nose. The sweetest things were the midgets. 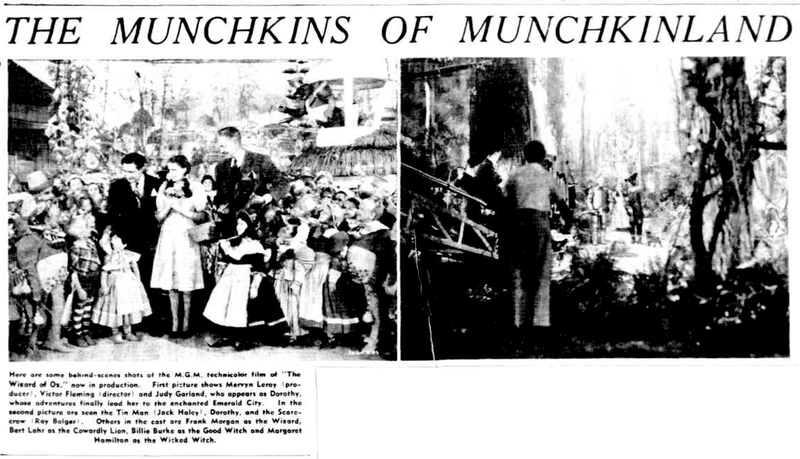 There were 120 little people, and they played Munchkins. They wore strange costumes and were so little men had to lift them into place on the set. The tables and chairs in the restaurant were too big for them, so they had their own cafe and, to protect their costumes, the studio made bibs for them to wear. They looked like children. On one set one day there were some children dancers working with the midgets, and school teachers had to round the children up for school. It was funny because they tried to make some of the adult midgets get to classes, and were the midgets indignant! Only one thing happened on account of me. At least, they laughed and said it was my fault. I wanted to treat the company to ice cream cones one day when we were working on the farm set. We were doing the first wind of the cyclone that day. Well, I ordered the cones and the poor waiter got on the set just as they turned on the big wind machine. Did that ice cream fly out of his hand! Whew! All over the stage. All of us got some ice cream on us and the only one who really enjoyed it was Toto, the dog, who ran here and there, lapping up ice cream until his tongue was almost frozen. There were many amusing events, but I can’t remember them all. But it was interesting, too. They had magicians on the set to do those amazing tricks, and I still don’t know how they were done. The picture is all music. The songs are catchy and the lyrics are the cleverest I’ve ever heard. But I don’t want to brag too much about the picture. You’ll think this is a business letter, when it isn’t. Anyway, I can’t help but think you’ll like the picture. I’ll try to write again after “Babes In Arms,” which is just starting. 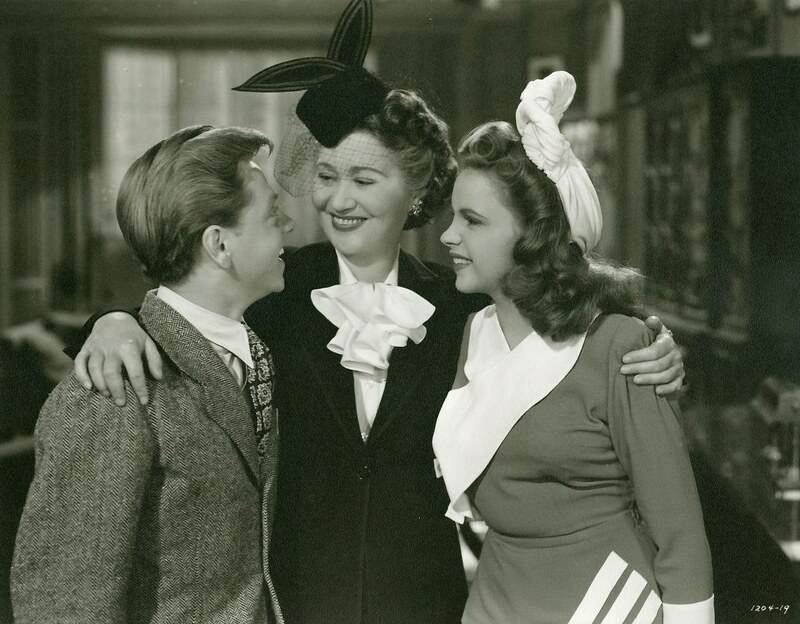 July 22, 1941: Filming continued on Babes on Broadway with Judy and Mickey Rooney filming a second day on the “Interior Jonesy’s Office” (with Fay Bainter) set and then moving on to the “Exterior Roof Top” set. Time called: 9 a.m. 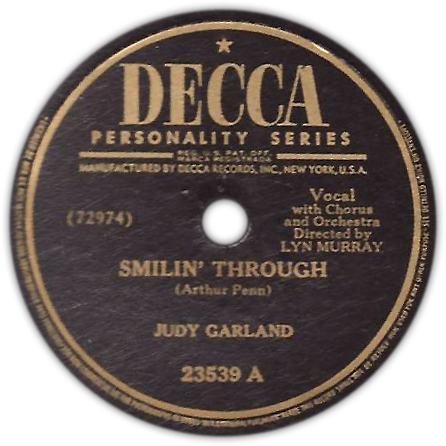 The assistant director’s notes state 11:30-11:42 – Wait to have Miss Garlands skirt pressed – Was lying down in dressing room; lunch 12:55-1:55 p.m.; time dismissed: 6:15 p.m.
It’s interesting that a seven-year-old Garland recording for Decca was still being advertised, but it makes sense. 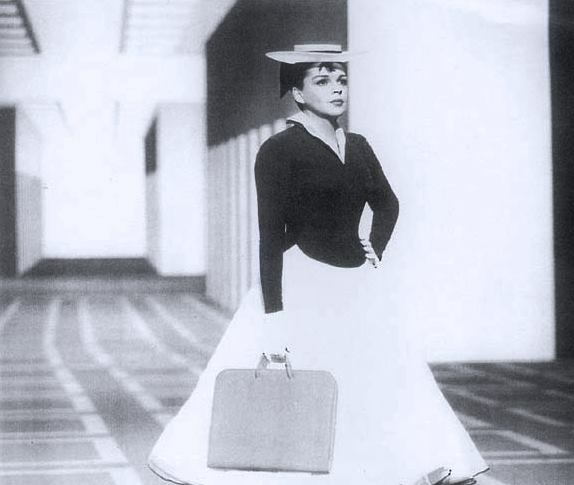 At this point, Judy was not under contract to any record label. The years between her leaving MGM in 1950 and the release of her four singles for Columbia Records in 1953, saw no new Garland recordings available to the public. 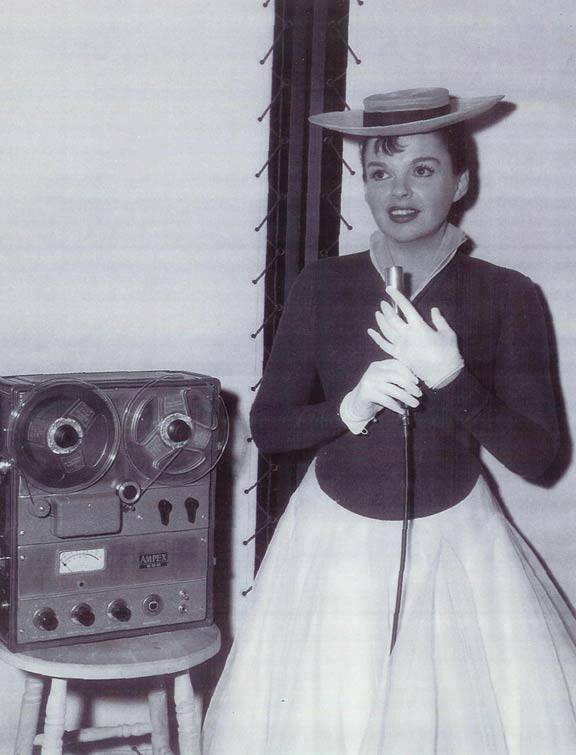 Judy stayed in the public eye via radio appearances and of course her record-breaking concerts, but the recordings of those live appearances were not made available. MGM Records and Decca Records released recording from their Garland catalog on a fairly regular basis and would continue to do so for the next several decades. 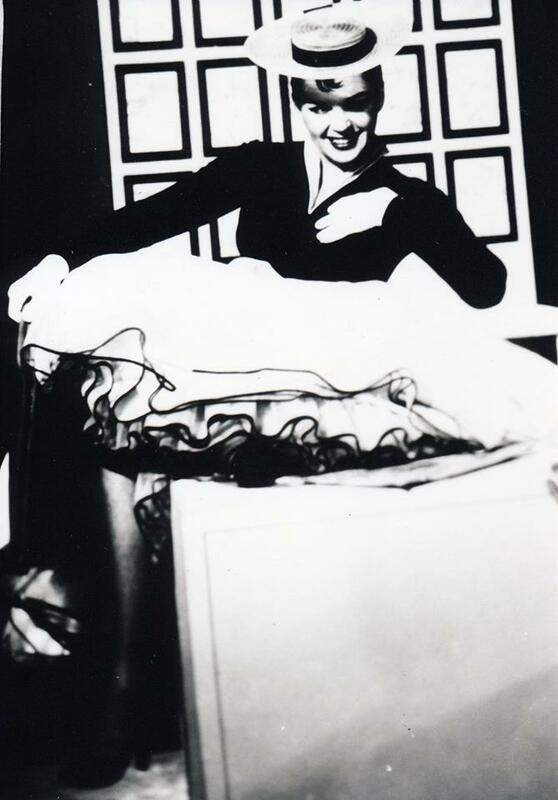 July 22, 1954: Filming on the “Born in a Trunk” number in A Star Is Born continued. This time scenes on the “Interior Second Agent’s Office” and “Interior Third Agent’s Office” sets. 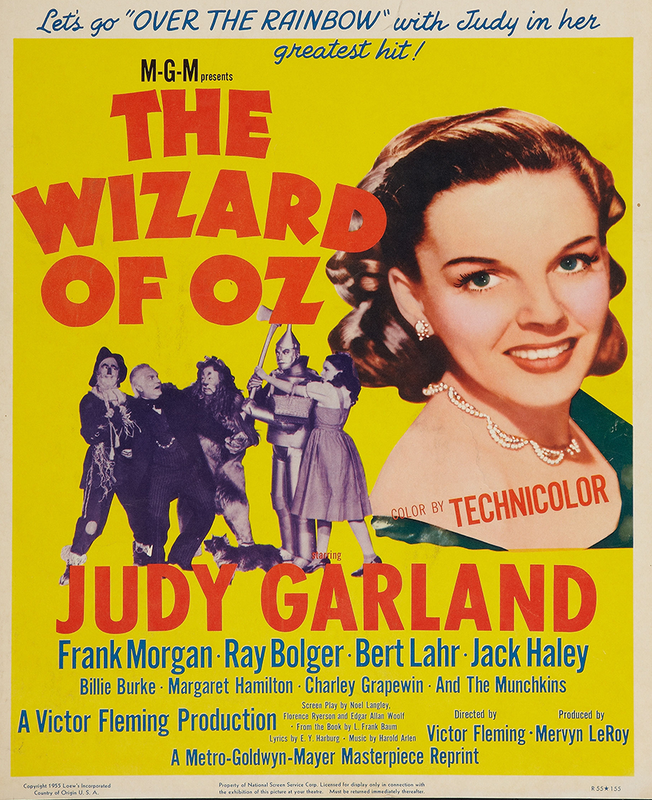 Time started: 5 p.m.; finished: 1:55 a.m.
July 22, 1955: The re-release of The Wizard of Oz was still in theaters. Here are a couple of columns about the film. 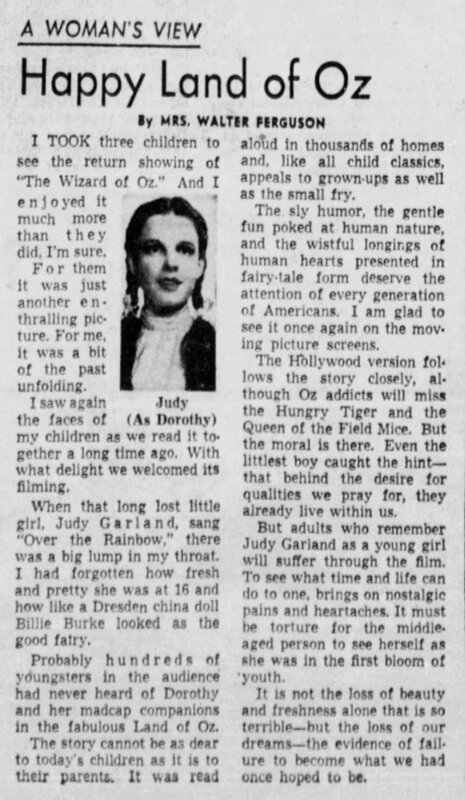 Mrs. Walter Ferguson of The Pittsburgh Press comments on the nostalgia the film brings to adults. She also notes that “probably hundreds of youngsters in the audience had never heard for Dorothy …” That’s true. The film wouldn’t make its TV debut until the following year, and the last time it was re-released in theaters was in 1949. 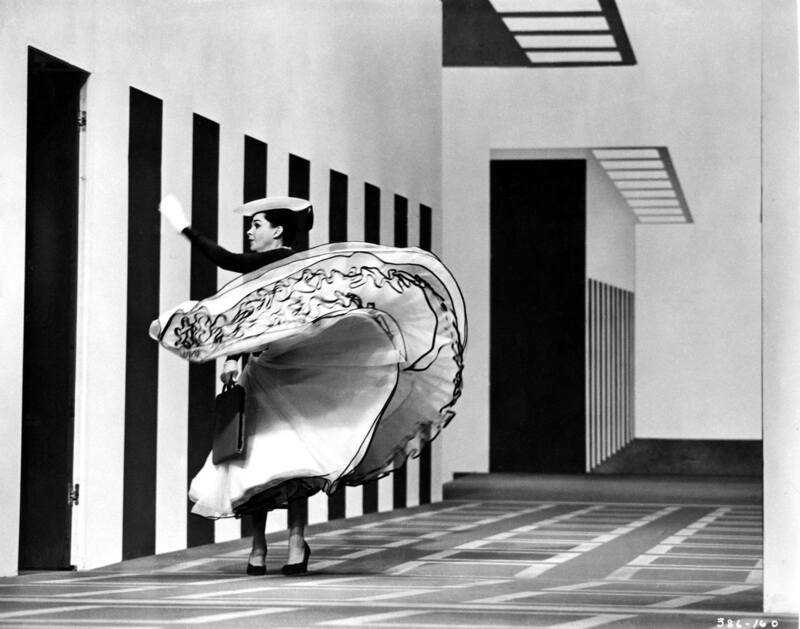 The annual TV showings began in 1959. This theatrical release was promoted as being in “widescreen.” MGM reformatted both Oz and Gone With The Wind into “widescreen” by chopping off portions of the top and bottom of the image to make it look as though it were filmed in widescreen. It was a bad idea that thankfully didn’t last. 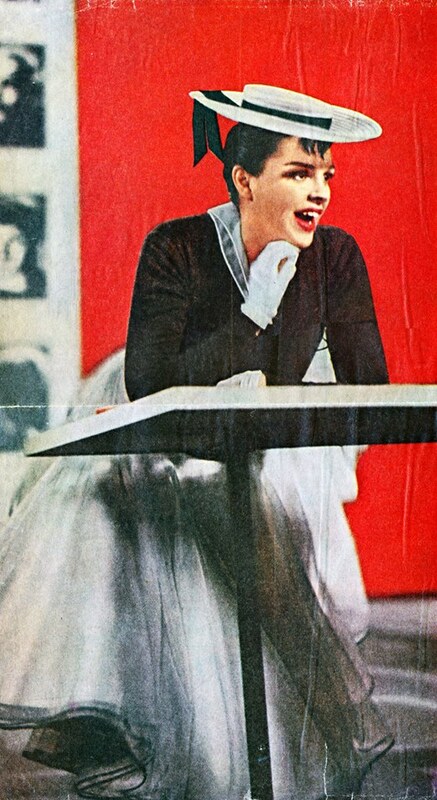 July 22, 1963: Videotaping of the dress rehearsal for “Episode Four” of “The Judy Garland Show” at CBS Television City, Stage 43, Hollywood, California. Guests: Lena Horne and Terry Thomas and series regular Jerry Van Dyke. 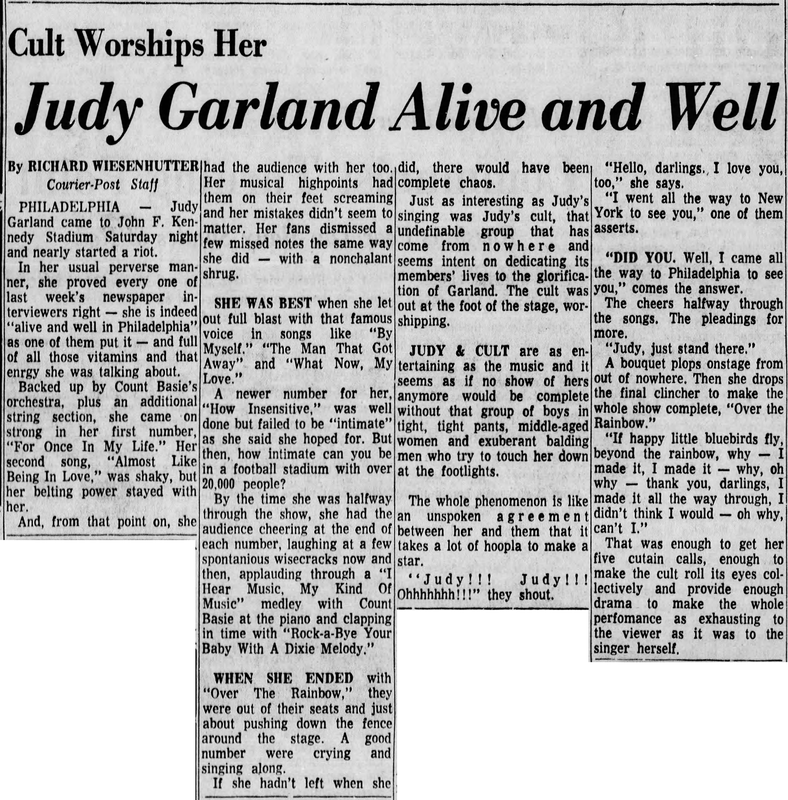 July 22, 1968: Judy’s alive and well and her cult worships her. So goes this review of her recent appearance at the JFK Stadium in Philadelphia, Pennsylvania. 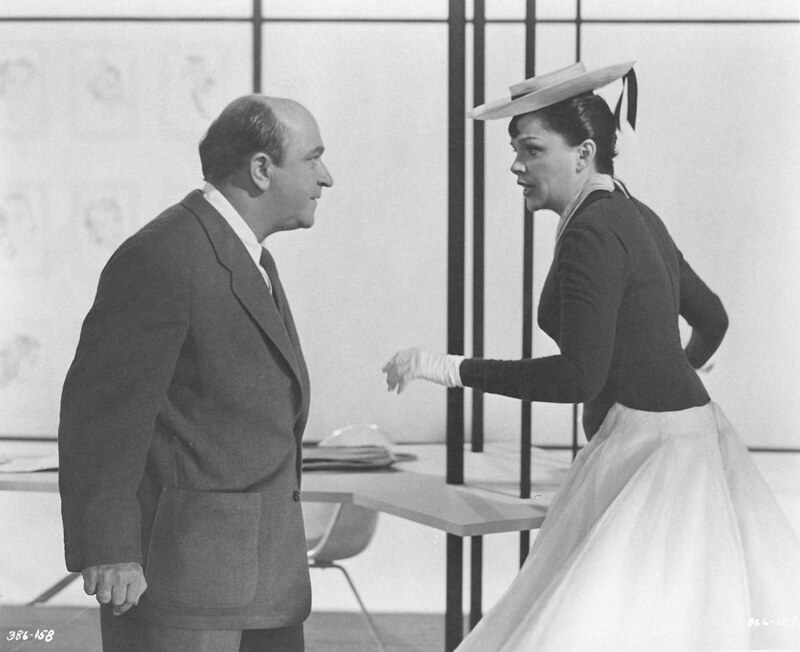 The review is insightful in covering Judy’s interaction with her audience and famous (infamous?) “Garland Cult” with Judy & Cult are as entertaining as the music and it seems as if no show of hers anymore would be complete without the group of boys in tight, tight pants, middle-aged women and exuberant balding men who try to touch her down at the footlights. 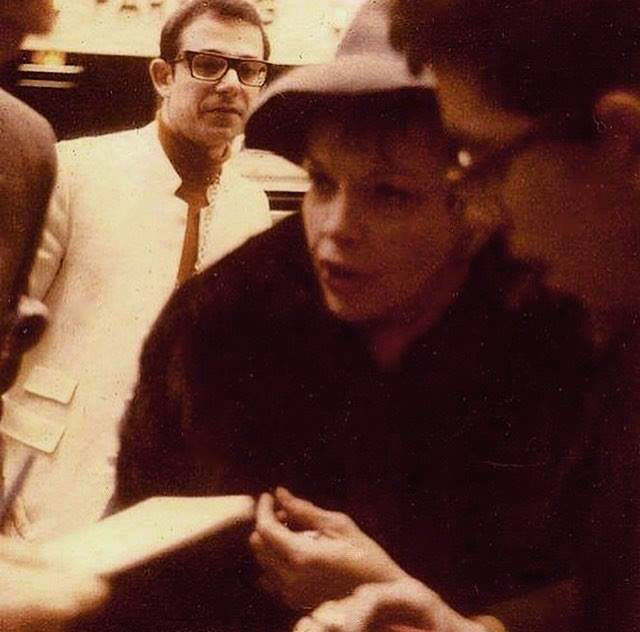 Photos: Judy and fans in 1968. 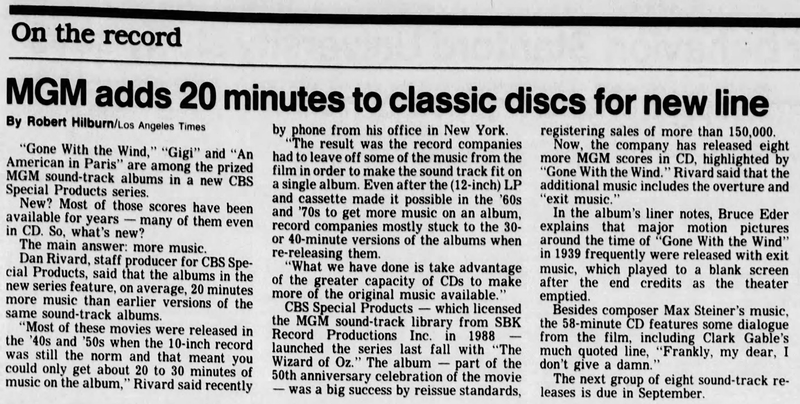 July 22, 1990: This article gives details about the re-release of MGM soundtracks by the CBS Special Products label. The label had released an expanded version of The Wizard of Oz soundtrack in 1989 and would eventually release expanded versions of most of the popular MGM Records soundtracks. Instead of using the abridged MGM Records versions of the soundtracks, CBS recorded new soundtracks recorded directly from the soundtracks of the films. In some instances they included outtakes. The results varied in sound quality but at the time they were the only, and usually first, CD soundtracks to the films. 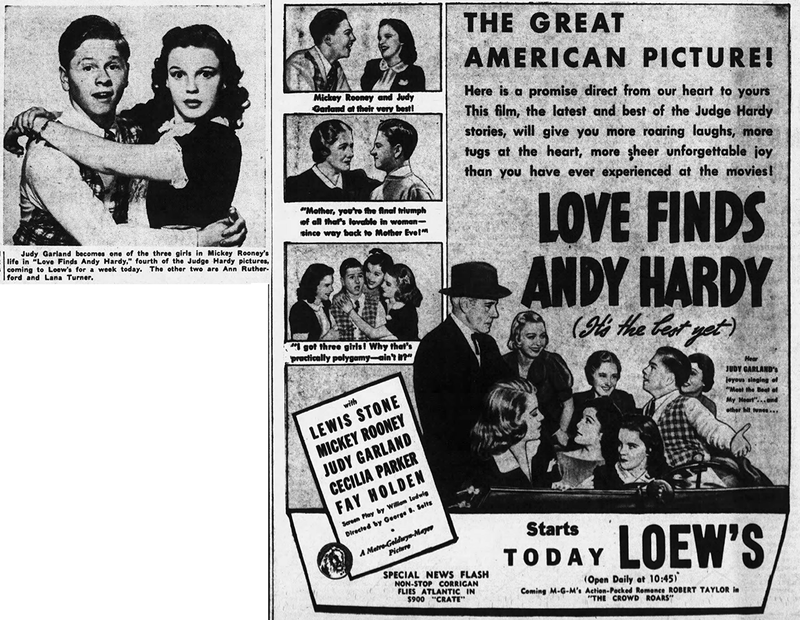 Click on the images below to check out The Judy Garland Online Discography’s pages for each edition (and the other editions of those soundtracks).